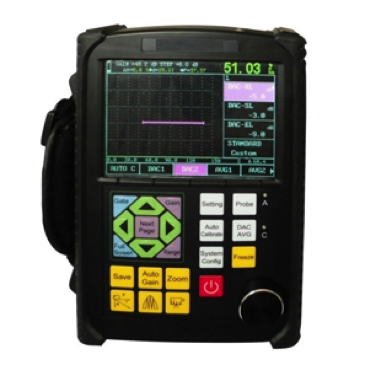 GAOTek Inc., a leading provider of fiber optic and telecommunication testers, electronic measurement instruments and other advanced engineering products, introduces a portable industrial non-destructive Flaw Detector with Automatic Calibration which can rapidly, easily and accurately inspect, locate, evaluate and diagnose various defects. GAOTek Inc., a leading provider of fiber optic and telecommunication testers, electronic measurement instruments and other advanced engineering products, introduces a portable industrial non-destructive Flaw Detector with Automatic Calibration (3 Switch Gauge) which can rapidly, easily and accurately inspect, locate, evaluate and diagnose various defects (crack, inclusion and pinhole, etc.) in a work piece without destruction. This portable flaw detector comes with automated calibration of transducer (with zero offset and/or velocity); automated gain, peak hold and peak memory, automated display of precise flaw location and automated switch three staff gauge which makes it a unique detector to be widely used in any fields that need defect inspection and quality controlling e.g. manufacturing industry, iron and steel metallurgical industry, metalworking, chemical industry, etc. This instrument is also equipped with display freeze providing high contrast viewing of the waveform from bright, direct sunlight to complete darkness and easy to read from all angles, gate and DAC alarm (acoustic-optical alarm), 14 standards of DAC. This new flaw detector can also be broadly used in the active safety inspection and service-life evaluation in fields such as aerospace, railway transportation and boiler pressure vessels, etc. It is also an essential instrument for non-destructive inspection industry. “We have always believed in delivering value, benefits and quality to our customers at substantially better prices than our competitors. This new flaw detector is no different as it is powered by our state of the art technology, offers world-class features and is extremely easy to use in the field,” says Dr. Frank Gao, CEO, GAOTek Inc.